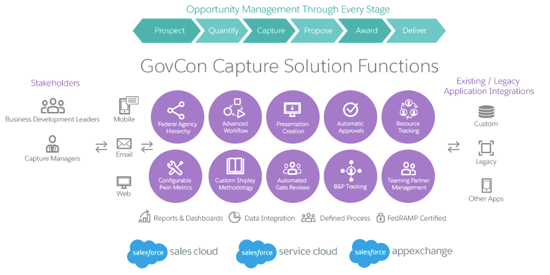 Win more business with Salesforce GovCon Capture. More than 5,000 capture managers use Salesforce GovCon Capture to drive pipeline at lightning speed. Find out how GovCon Capture makes it happen. Win more business with Salesforce GovCon Capture. The fully integrated and configurable opportunity lifecycle management solutions increases P-Win rates by 20% and reduces capture time by 30%. More than 5,000 capture managers use Salesforce GovCon Capture to drive pipeline at lightning speed. Find out GovCon Capture's makes makes it happen.